I've been wanting to add a team round type for maps like Castle/CTF battle grounds and Pirate Island/DM, adding a zombie mode would probably be much easier once I make my own super simple team system. Slayer is good and all, but it's excessive to require and use it for this gamemode, and many of its features would go unused. This probably wont be made for a while though. Alright I've uploaded the v8 update. - disableRoundTypes map config.txt setting has been removed. Might add an alternative that works back in if there is demand. It's perfectly safe if you leave this in a config.txt, but it will do absolutely nothing. - Added Old School Colorful Weaponset pack with a fix by gr8dayseth and icons added by The Resonte!. I've expanded on these additions by making the icons recolorable (making them black and white and brighter) and changed the colors of most of the weapons in the pack. The sniper rifle and shotgun have "OSchool" added to their ui names to differentiate from the sniper rifle and shotgun already in the gamemode. Other misc edits have been done, including adding a weaker attack to the baseball bat if you abort its charge. - Added custom weapons Blockhead Ray, Pinball L., and Pong Gun. The pong gun is lots of fun. You can spam it everywhere, though it only does 5 damage. You can somewhat do this with the Pinball L. as well. The Blockhead Ray will turn horses and chickens (or anything that doesnt use the default player model) into no-jet players. - The third weapon in randomised loadouts will always be a weapon from the map's loadout or alternate loadout. - The alternate loadout system has been changed a bit. Instead of picking between two entire loadouts, it picks between the two weapons in the same slot per slot. - Homing rockets have been nerfed considerably. They do much less damage, and it takes longer to fire more rockets. May need some input on this one. I may have nerfed them too much. - Many fixes, including stopping players from spawning during round or map transitions. 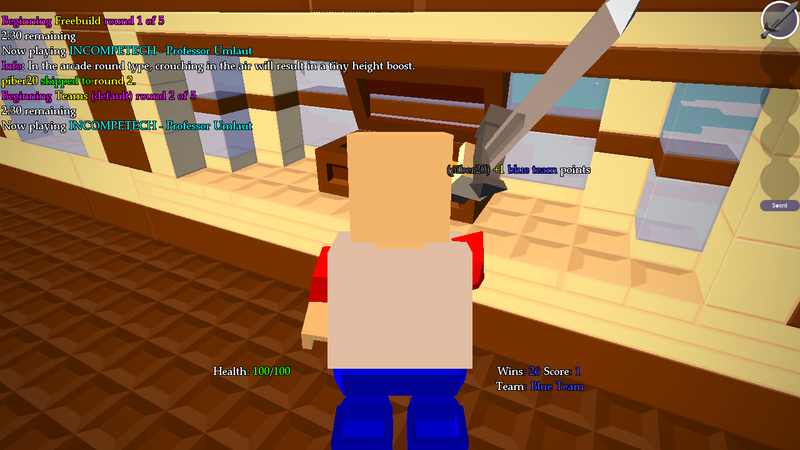 - Custom playertypes including a buff player and a superjump player. - Neat little bounce effect added to dead body parts. 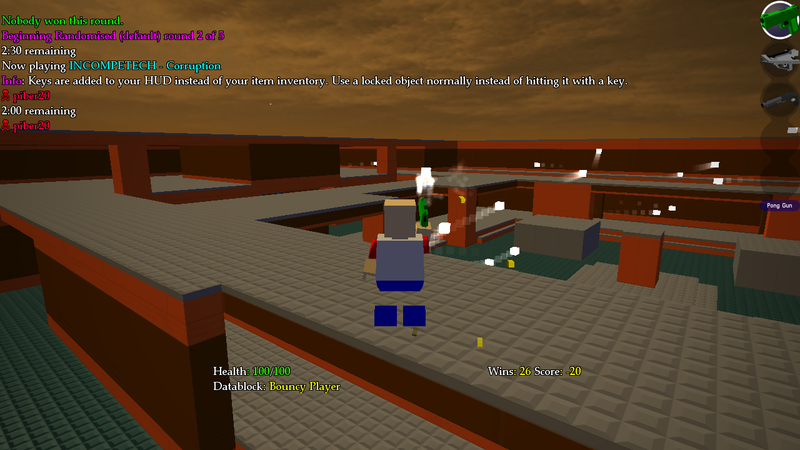 - It tells you what player datablock you are during the Randomised and Random Balance rounds. I added a list of item datablock names to the op. Should be useful for map makers. I know I keep serving up new features and stuff a little too fast, but having lots of free time and getting your support will do that. I decided I would try to take a shot at adding teams. If you name spawn bricks redTeamSpawn for example, and enable spawns for that team in the map's config.txt you could restrict teams to spawning on specific spawn points. Spawns spawn spawning spawn spawns. All players in a team share the same points, to the point where one person losing or winning points will affect everyone. This also allows me to touch up the tie scenereo a bit, now if people tie everyone who has tied is considered to have won, same system is used for team victories. This is currently using a simple, lightweight, and custom team system I've made myself. I'm considering removing the Freebuild and Ultra Classic round types, They were being used as filler and to show off the default tool weapons before round types like Randomised and now Teams were implemented. I feel they're somewhat unfitting and a player could randomly stumble on the default tool weapons easily in the randomised round types. Thoughts? Map makers can restrict teams to spawning on bricks named with [teamcolor]TeamSpawn and setting the respective config.txt setting to true. Chat is aware of teams, people who talk will have, for example, RED next to their name in chat, and team chat should work as I expect it was intended. - You can also /disableTeamRounds if you dont like teams! - Buffed homing rockets a bit, was too nerfed before. - Added /stats command that shows some cool numbers that are now saved. This includes Wins, Total Points, Total Positive Points, Total Negative Points, Best Score, and Worst Score. Quick and small v10 update to fix team chat a bit (it was setting the message to the sender for as many members in the team, instead of sending the message to all team members lol) and make it less abusable. Now it has flood protection, a replication of the default as best I could, and it strips "<color:", "<font:", and "<bitmap:" from what players send. Hopefully I've got it very close to normal chat's anti-abuse measures, as I've had to basically make a new chat system to get team chat working. Also team chat is unusable if you are not in a team. I may also "remake" and do the same stuff to normal chat in a future update for consistency. Same flood rules for both chats etc. There's also two new commands, anti-versions of ones I added in the previous version. You can now /forceTeamRounds if you absolutely love teams, and you can /disableRandomRounds if you dont like the rounds with the randomised loadouts. Updated the gamemode to v11. My main focus was to clean up a bit and to make the gamemode look and play nicer, but there are also a few really neat additions. Some emitters have had their colors change due to the weapons not being super colorful anymore. A single revolver has been added. Akimbo revolvers has had its color made a bit more blue to mimick the way Akimbo Guns' colors are. Kill icons have been added/adjusted. I have been given permission to release my changes to the Old School Weapons as a standalone add-on, so I'll start working on that too. I also want to release some other stuff in the gamemode as standalone addons, namely the key stuff and the cannon launcher, so look out for a bunch of new add-ons in the near future. - The Magnum has been removed in favor of the single revolver. Sorry! - Huge cleanup to the code and reorganisation. teamspawnX config.txt settings are no longer needed to get teams spawns to work. You only need to name bricks in the correct way now. Team rounds work differently internally. - Support for 4 teams during one round has been added. New config.txt settings have been added to allow you to choose colors for the third and fourth team. You can make your maps force two team rounds or four team rounds in your config.txt. If you dont, team rounds will randomly pick two or four teams. Also grapple platforms has been returned to its former glory of having four different color areas! It supports the 4 team system. 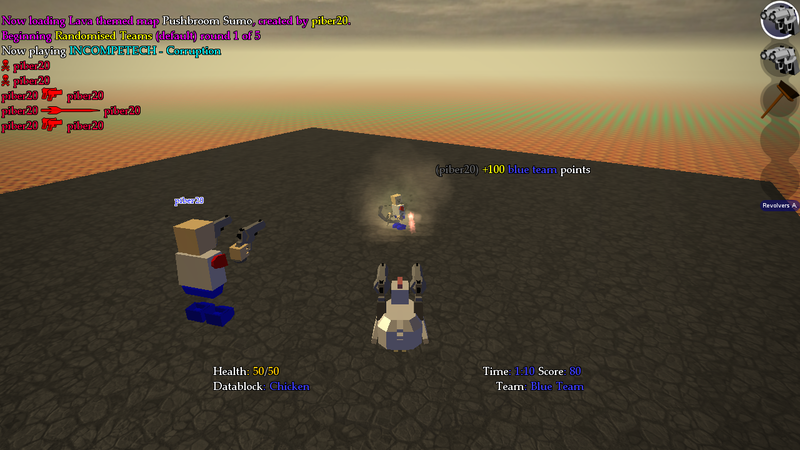 - Added ability to disable spawning players as some of the "cheap" playertypes. Specifically the chicken and the tiny playertypes. - You can now completely disable crouch jumping. Useful if you have a ton of players and the crouch jumping is making your server perform badly. - Added custom chicken ray. Turns players into chickens. Probably in all meanings too, haha! - Added literal Hand Gun. Edits have been done, now it's like the fist in that it uses an empty model and the icon is yellow. A new kill icon was also made. Looks off when someone is shooting or whatever, but it should be a nice little gag. The edits have been done mostly because you cant really recolor weapon models, and the original model was a tan color, which people may not be using. They could have gray/black hands resembling gloves, or different skin colors, or a mess of colors. - Probably more stuff I forgot. If you're talking about the old school weapons in the weapon list near the OP, they're simply named after colors to be more compatable with the actual old school colorful weapon pack. No indication that they were ever colored differently should be ingame. Still, glad to see people are liking this! I appreciate all the work you're putting into this gamemode Crispy. Everybody loves a good deathmatch. Can you add a map vote feature, which if enabled, allows people to choose the map they want to play? Also, potentially add a /rtv command that if enough players do it then the map vote will occur immediately? EDIT: One more thing, can you add more music? The current selection can get quite boring to listen to. I could look into adding this. This was suggested to me once before, when I was playing on someone's server hosting this. One more thing, can you add more music? The current selection can get quite boring to listen to. I've been wanting to add more music but I want it to be high-energy or fit with the themes. If you could supply me with some music, perhaps in youtube videos, soundcloud, or even royalty free music websites, I could see if I can add and loop them myself. Next DM version will have old school weapons modified v2 so expect some nicer colors. I also want to fix that bug where loading a map that has invisible water after another map that has invisible water will make that water deep and not kill players. Still have yet to figure that one out.